So here is the second game we played this weekend. This was to be the game where I wanted to test an infantry heavy game with few armour and no AT-guns. Again I need to apologize for the picture quality. While the picture quality was slightly better than from Fridays game, it is still far below par. 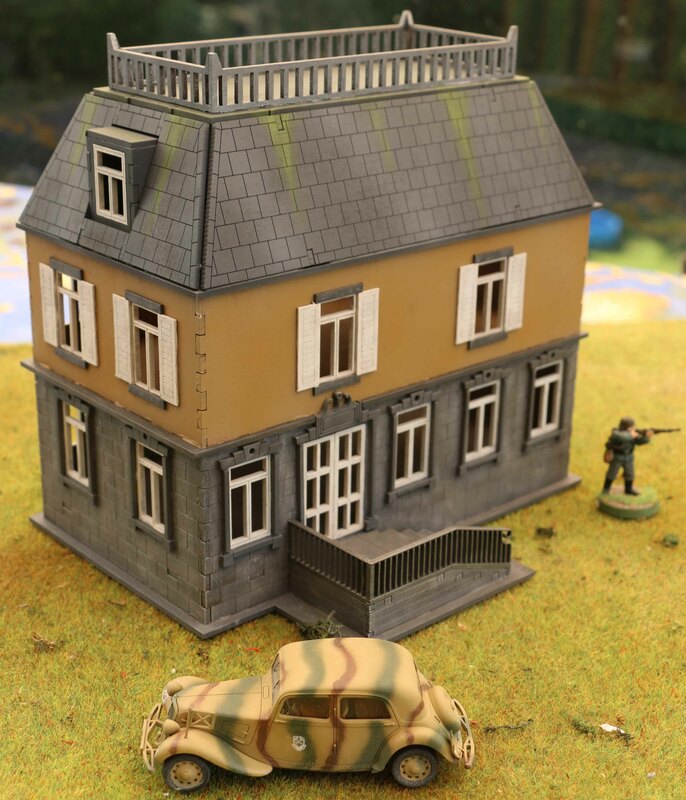 We set this fictional game somewhere on the Cotentin Peninsular in the days after the D-Day landings using the “Take the Hill” scenario from the main rules. 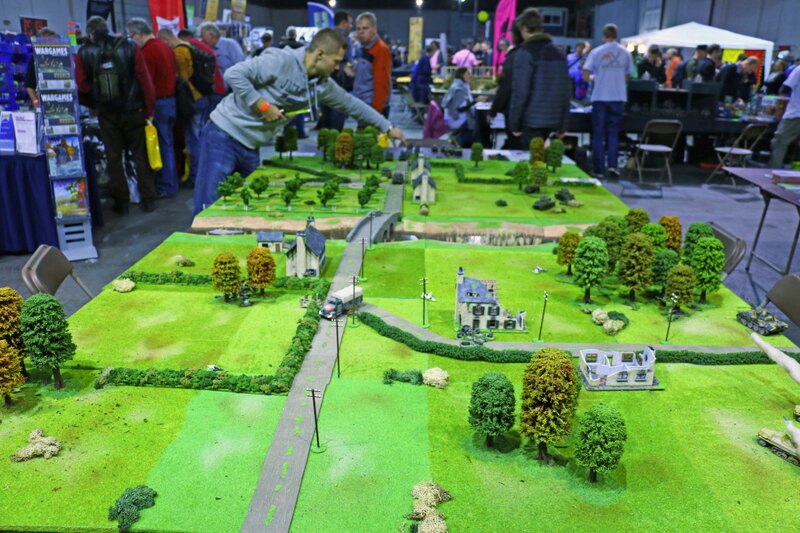 Fitting enough, there was a hill in one corner of the table with a small village. 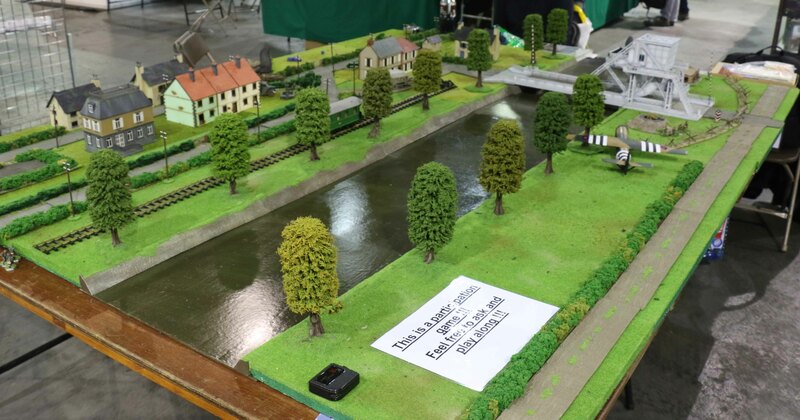 The rest of the table featured some corn and wheat fields, grazing cows, roads, hedges and small woods. The Americans (played by Martin) consisted of a forward infantry HQ, a regular quality infantry platoon (HQ, three fire teams, three BAR teams), a medic, a .50cal HMG team, an artillery spotter team mounted in a jeep catering for a battery of off-board 105mm howitzers, a Greyhound scout car and two M10 Wolverine tank destroyers. 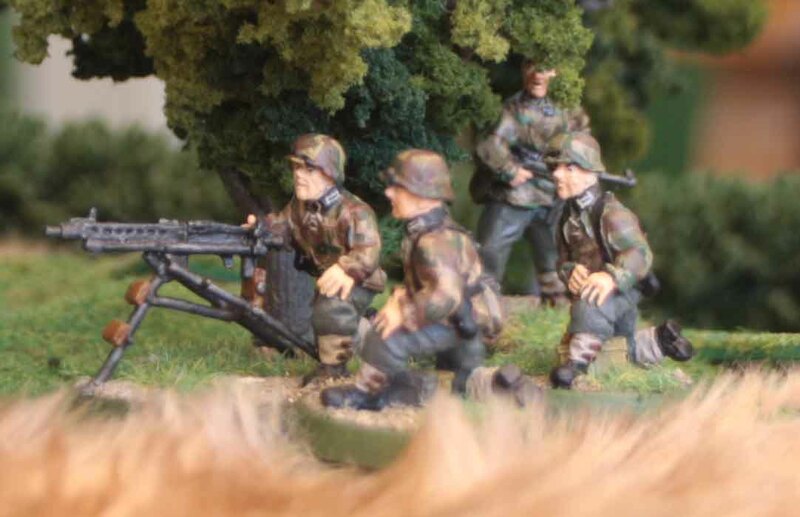 The Germans (played by me) was made up of a Veteran Panzergrenadier platoon (HQ, three infantry sections, three MG-42 LMG teams), a medic, a tripod mounted MG-42 HMG with extra loader team, a Panzergrenadier foot scout patrol, an on-board 8cm mortar team, an artillery spotter team catering for another two 8cm mortars off-board and a StuG IIIG. Both sides were able to deploy 50% of their forces at the beginning of the game, with the rest arriving as reinforcements at the beginning of turn 4. 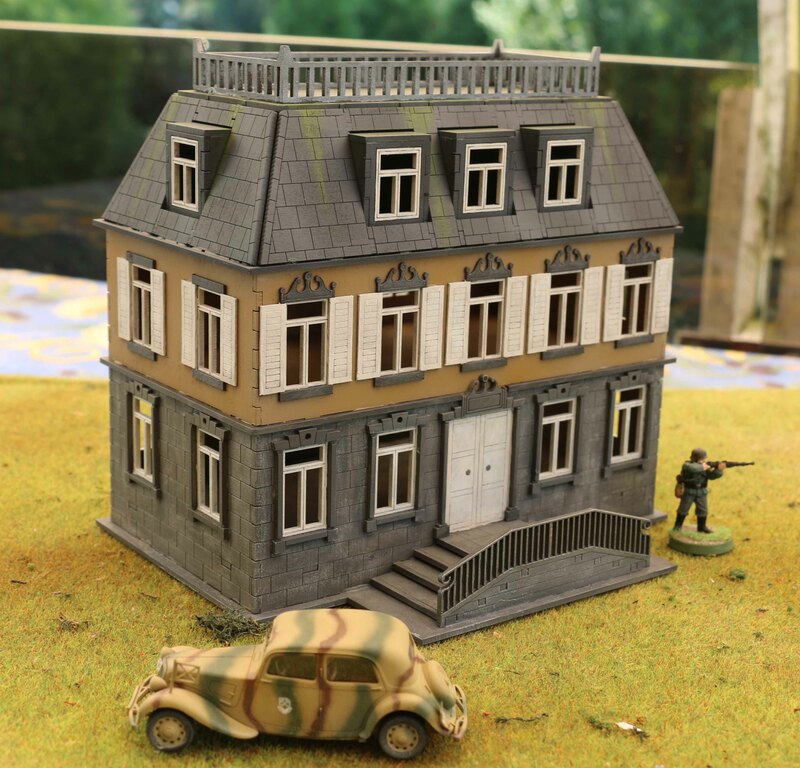 The German defenders deployed the StuG behind the village on the hill road, the HMG team on the their left flank in the corn field, the Panzergrenadier scout team in the bombed out semi-building with the spotter team in front of them in the garden. One of the LMG teams deployed on the upper floor of the detached building, with the HQ on the lower floor and the 8cm mortar behind. Four of these units started in ambush positions, but I completely forgot to make use of that (which cost me dearly), so I will not even mention which ones. 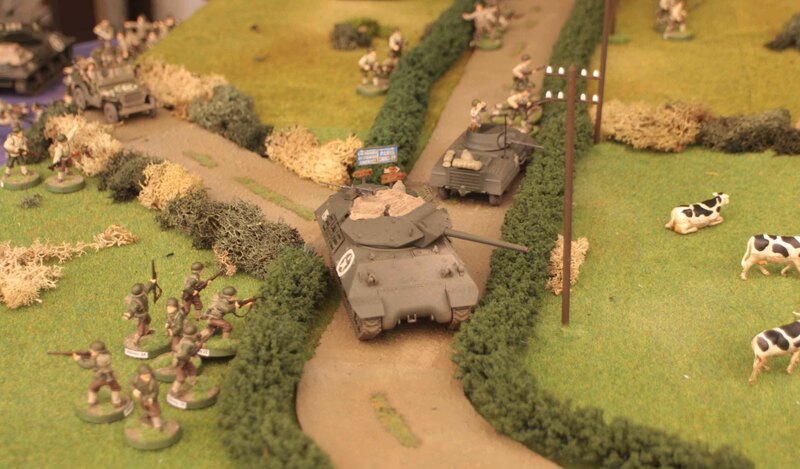 The Americans deployed three vehicles on the road leading onto the table, with the M10 being front, the spotter jeep bringing up the rear and the Greyhound sandwiched between them. One of the infantry teams was in the field to their right one on the road on their left. In the field to the left there was also the Forward HQ and a BAR team. The Americans went first and there was a general advance of the infantry. Then the artillery spotter called in fire and that one really hurt. Both barrages were aimed at the bombed out semi and were virtually spot on target. 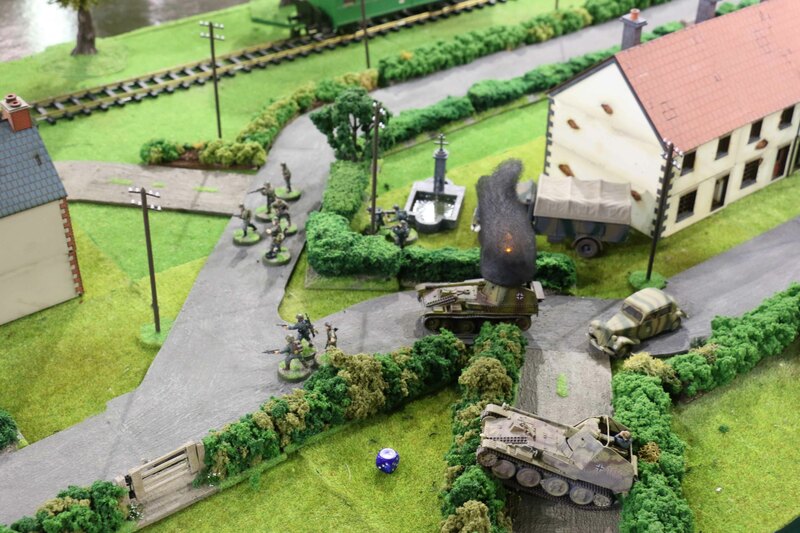 This resulted in the loss of two Grenadiere from the scout team, the spotter teams Kübelwagen went up in flames and both the recon section and the spotter team were pinned down by the fire. No idea why I did no pre-empt this with a mortar strike of my own using the ambush option! 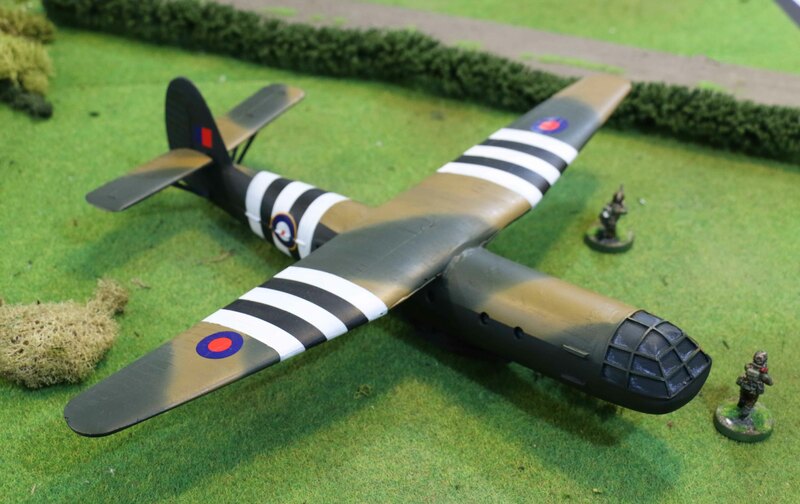 Both the Wolverine and Greyhound moved forward with the intention of adding their own firepower to the carnage, but the M10 failed to spot the target house amidst all the explosions and the Greyhounds HE shot missed. In general the Germans decided to let the Americans get closer so their only action for this turn was for the pinned troops to stick their heads out again. The Americans went first on the second round again. And once more the artillery was spot on. 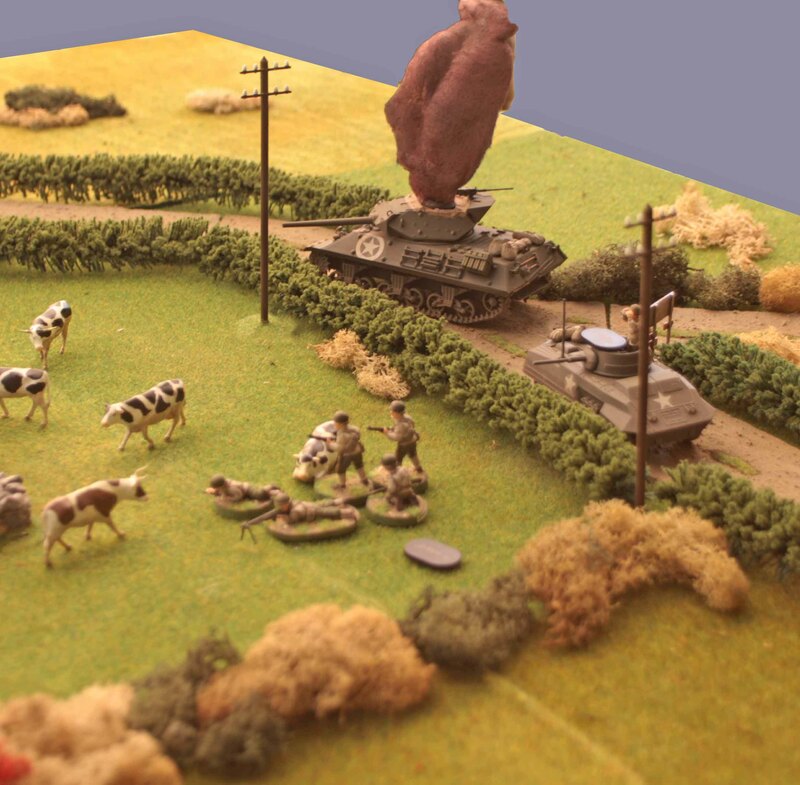 And this time the tank destroyer and scout car added to the carnage. While the Grenadiere lost no man, they withdrew deeper into the ruins for protection. Far worse off was the spotter team, which was wiped out. Otherwise there was only a further advance by the infantry. 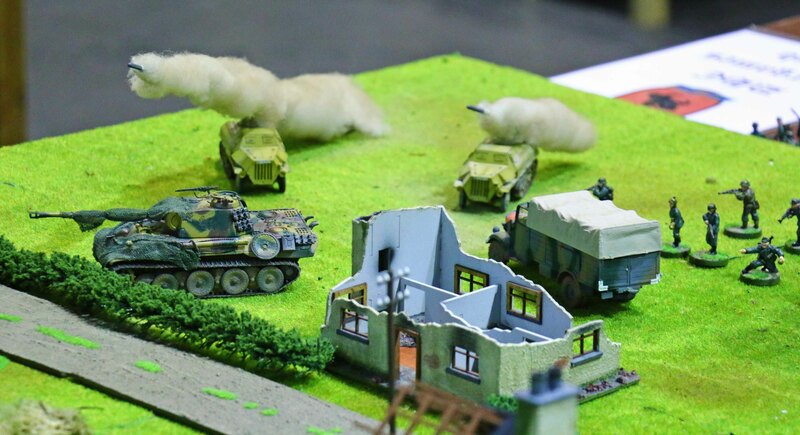 The StuG decided to interrupt the move of the infantry advancing towards the village with its only round of HE ammo, but that one missed wild. Now the Germans got into action. I finally remembered, that my mortars could also be directed in by the Grenadier HQ, which they promptly did. While the first salvo scattered a good deal this was actually quiet good, for one round went straight into the open-topped tank destroyer (I rolled double sixes for my anti armour roll) setting it aflame. The second salvo scattered too, but it came down amidst the infantry, causing little physical damage, but pinning them down. In the end the salvo pinned the artillery spotters, the forward and platoon HQ´s as well as the BAR section. 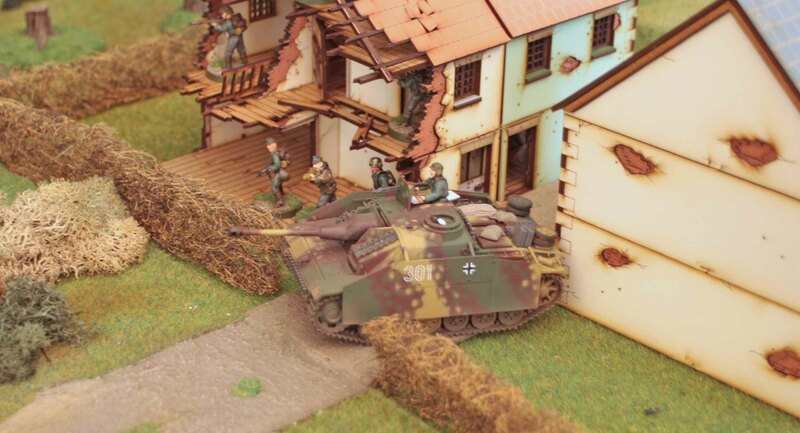 Now the StuG rumbled through the village and fired its roof mounted MG at the infantry advancing towards the village, sending them for cover as well. So essentially, Martin was down to two un-pinned units! As a result the Americans did virtually nothing but get up again after the mortar barrage, which Martin did exceptionally well, rolling for 5 unpinned units! The only real action was a further advance of the infantry fire team on their left flank. 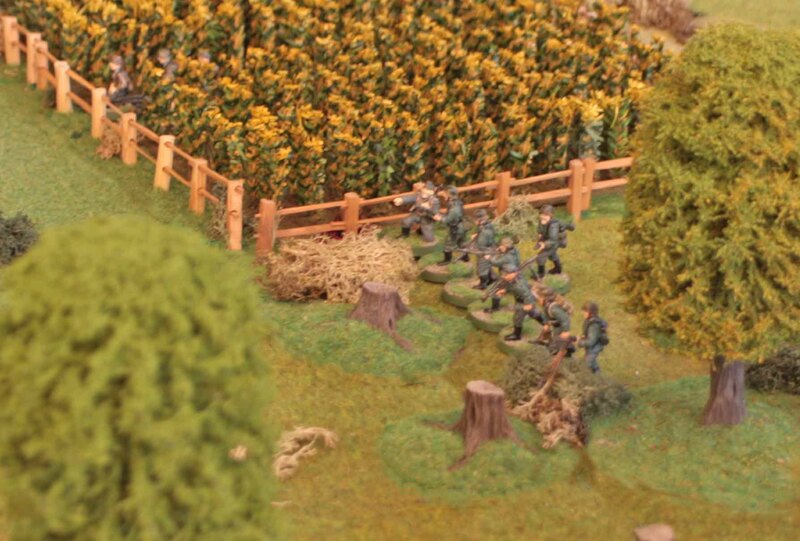 At this point the HMG team in the corn field decided to take them under fire, only to find them out of range. 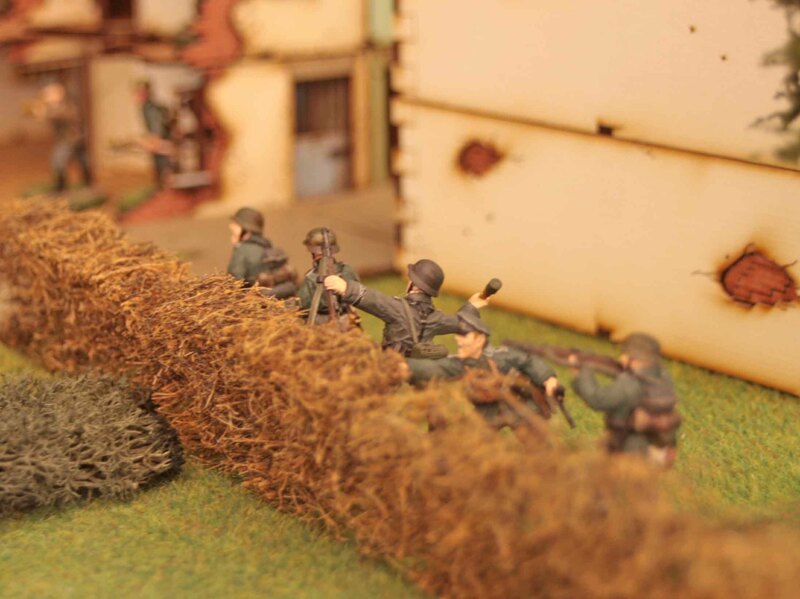 With initiative passing back to the Germans, they decided to fire their off-board mortars once more. And again the results were horrible for the Americans. The Greyhound took a round trough its open turret, too (I rolled another double six!). The fire team, forward HQ and spotter team all went to ground again, the HQ and spotter team each taking a casualty for good measure, too. The StuG shifted its MG fire to the BAR section in the fields, but failed to make an impression. At the same time the on-board mortar team relocated out of the shadow of the house to fire at the American infantry advancing on th village, but failed to spot them in the hurry. The next round saw the arrival of the reserves. The American reinforcements arrived on the table and began to move forward. The most interesting was the second M10 now present, which took a shot at the StuG at once. Fortunately for the assault gun, it was only a glancing hit and did no damage. 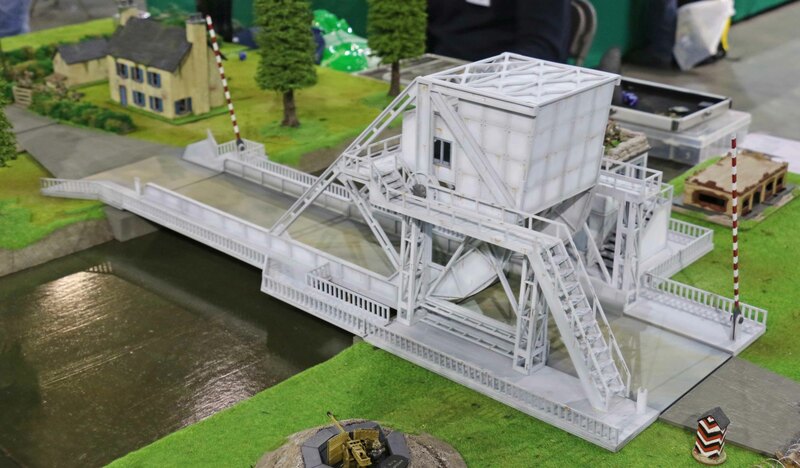 Otherwise there was not much going on, except for the American fire team advancing on their left flank which decided to try their luck with the HMG team. But before they could fire, they failed to spot them. HMG team, seeing this decided to spring their trap and fire at their adversaries, but they too had problems spotting them behind the hedge with all the smoke drifting over the battlefield. I rolled well for the Germans and all the remaining troops made it onto the table at once, beginning their track from the table edge. The on-board mortars opened up once again, this time wiping out the spotter team, ending the threat of American artillery for good. In addition they also wiped out the forward HQ and the BAR team. Now the StuG decided to fire back at the Wolverine, it turned, fired and missed. 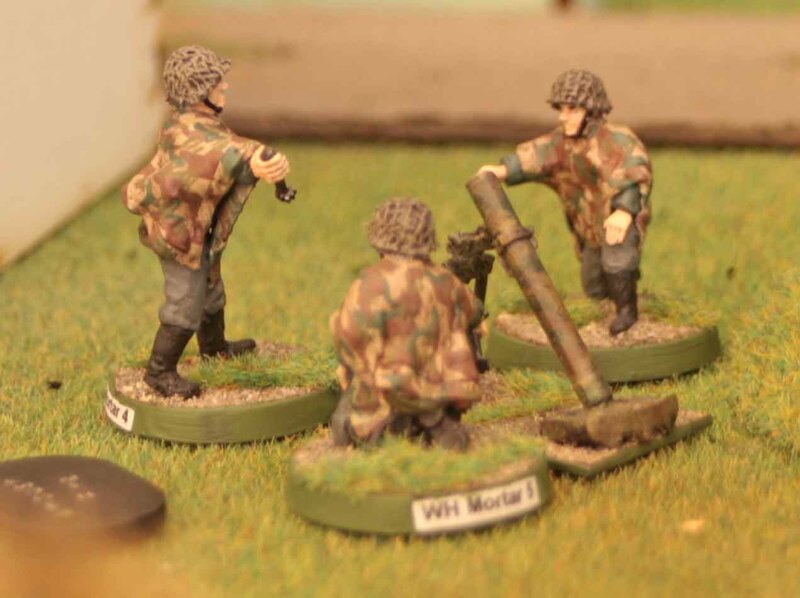 In desperation, the on-board mortar team fired at the M10 and now they got lucky, too. They too scored a direct hit and destroyed the tank destroyer (this time I rolled a five and six… not bad for one day!). But there was one more thing. 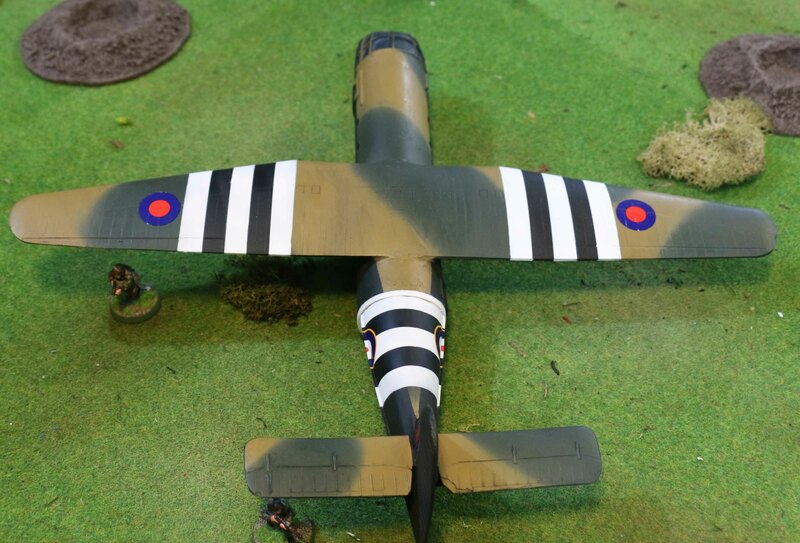 With all the American losses they had to draw a lot of chits, one of them being an air support counter, meaning that next round the Americans would get support by P-47 Thunderbolt. 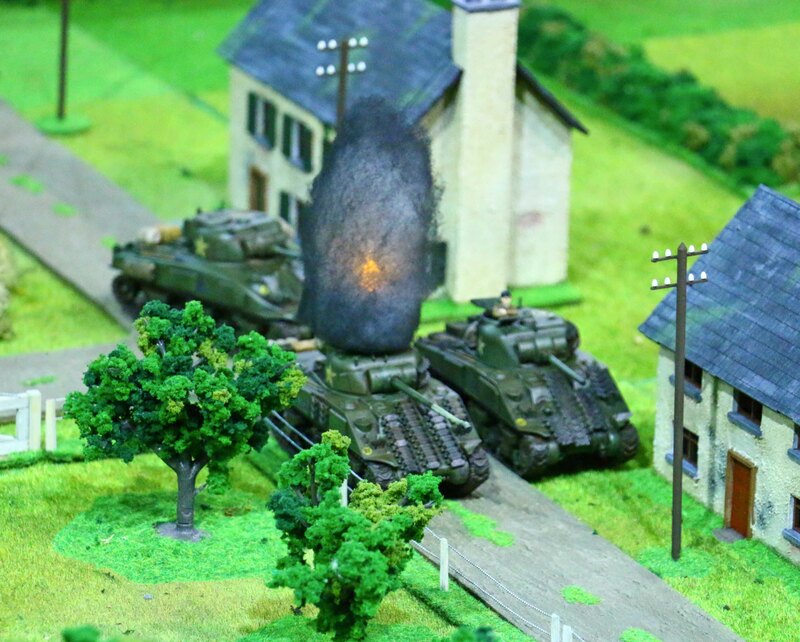 And the fighter made quite an impression the next round firing its rockets at the StuG and blowing it to smithereens. 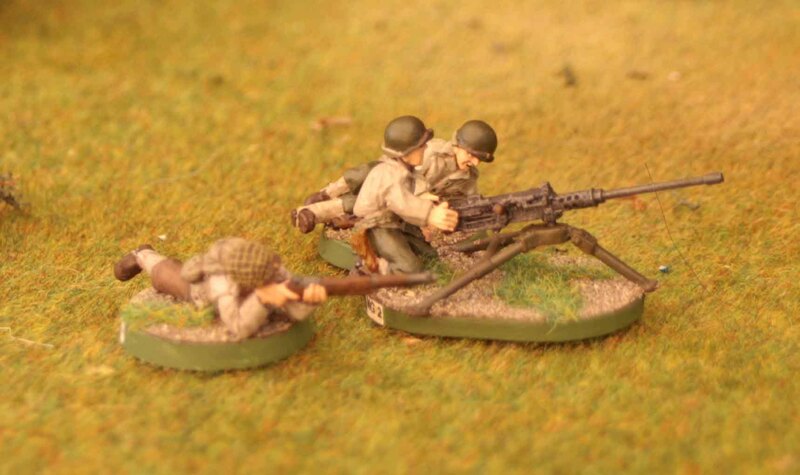 Once more the American infantry wanted to fire at the HMG team and once more they failed to spot them. The .50cal opened up on the Grenadier scout team in the house and caused them one more casualty. But this was about it for the Americans. Now the Germans picked up their attack again. With the majority of the American troops now on their left flank, the German HQ moved out of the building into the yard to get a visual on them and started to direct the off-board mortars in. 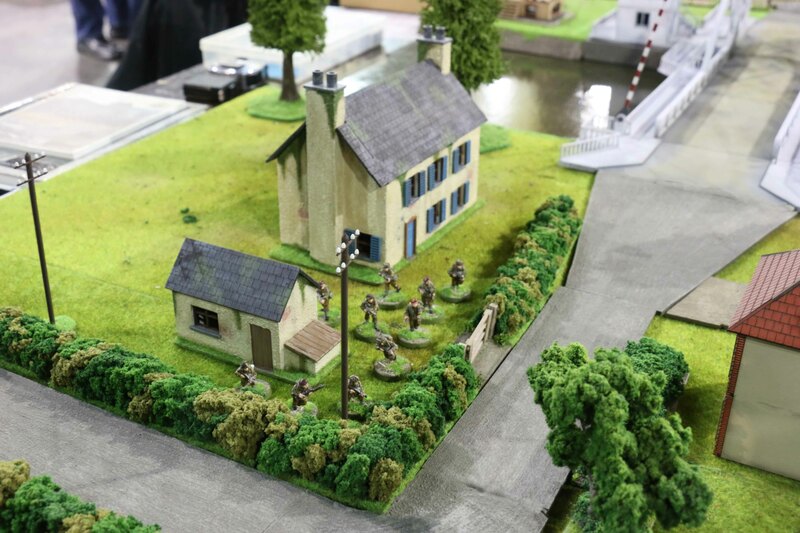 The attack pinned the American infantry en route to the village and the HMG team, but most importantly killed off two of the .50cal crew sending the last man fleeing and this also brought the whole American battlegroup to its breaking point, ending the game. All in all, we had an extremely entertaining game, dominated by artillery and mortars. This definitely showed us the need for some counter-battery options. 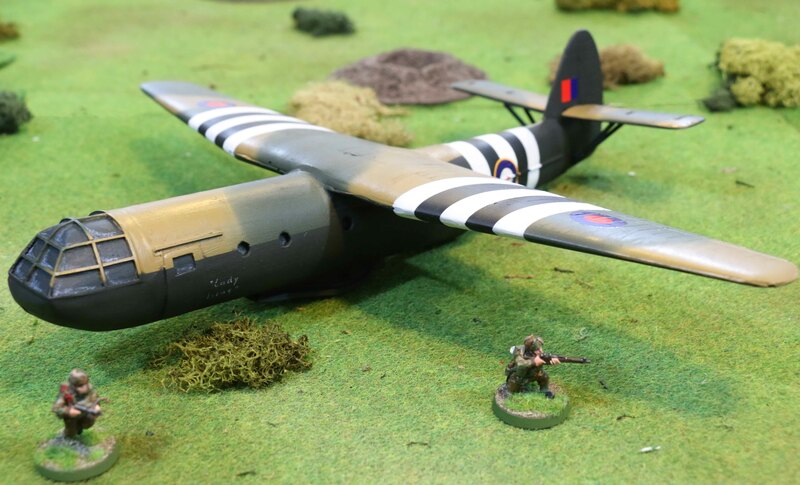 As virtually anyone with a little knowledge of military history will know, last Friday saw the 70th anniversary of the Normandy landings (aka. D-Day). 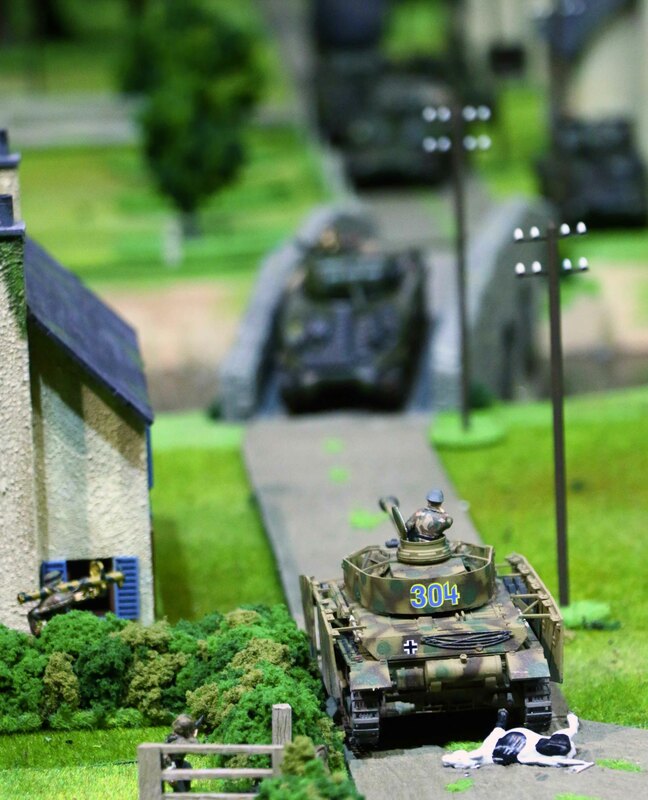 We decided to take the opportunity to play some games set during the Normandy invasion. The first game was played on Friday with Julian and the second one on Sunday with Martin. I also wanted to take the chance to put the rules through its paces. All the previous games we played featured a realistic amount of armour compared to the number of infantry, but I wanted to see how they felt with no or very little armour. I also wanted to see how it played out when not using the Battlegroup force lists to create the forces for the game, but using a scenario from a third source. Now before I start with the game reports, please let me excuse the more than poor picture quality. My camera is acting up these days (which also caused huge problems during our trip to Scotland). Amongst other things I cannot use the lens best suited for close-ups, I cannot use the program that allows me long exposure times (essential for close-ups) and most pictures are overexposed. In other words, I simply cannot take any pictures on the usual level of quality. This was the game without any armour using a ready-made scenario. 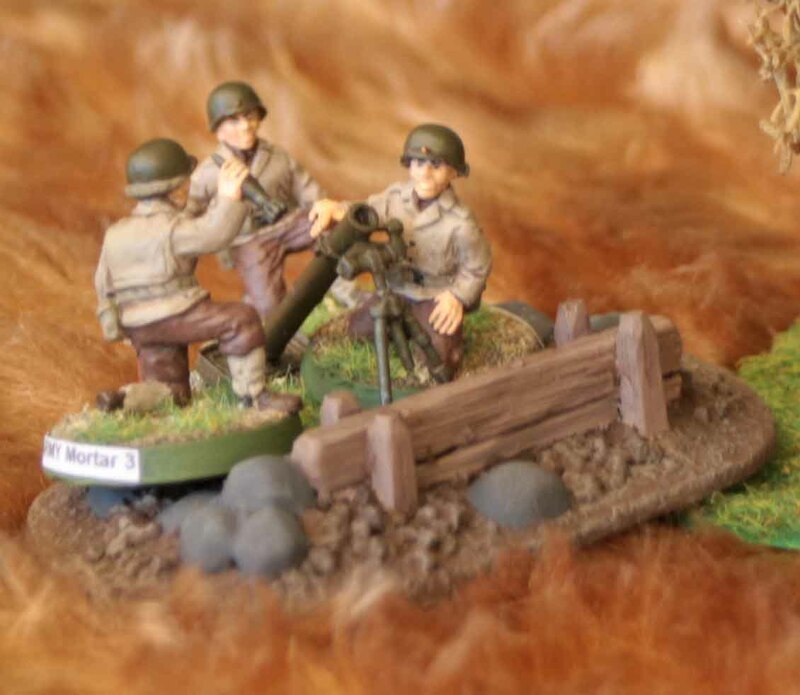 In this case “Purple Heart Hill” from the SkirmishCampaigns book “Normandy ´44 – Heroes of Omaha and Panzer Lehr”. 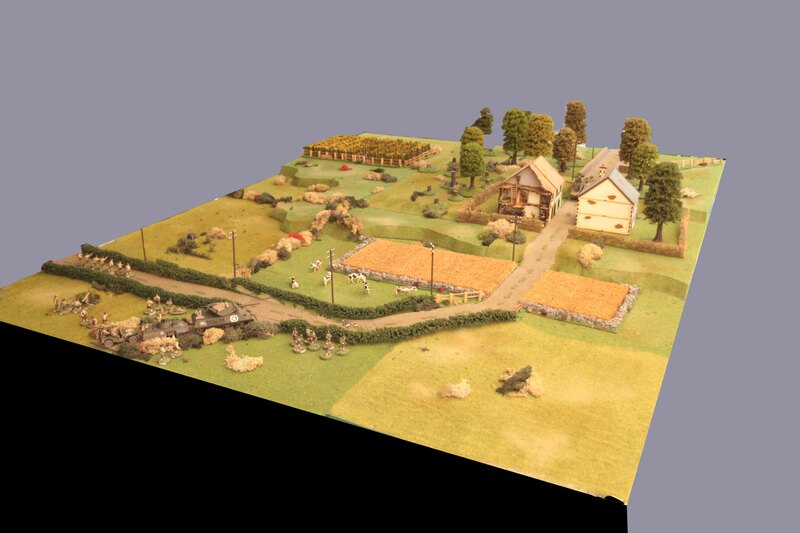 The scenario features the defense of Hill 108 (rather a slight slope, which is why you the board shows no real rise) by the American 175th Infantry Regiment against Elements of Kampfgruppe Bohm on June 18th. 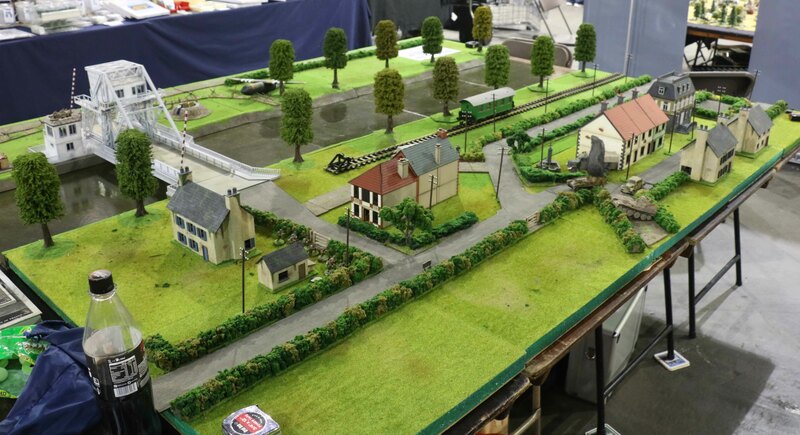 The table featured fields, an orchard, two light woods, a little low bocage and most importantly a ravine running most of the western edge of the board. 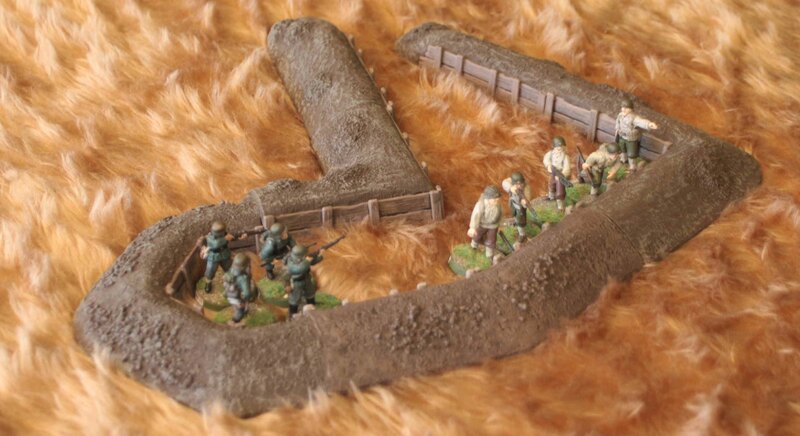 The Americans would deploy in a trench on the northern half go the table which the Germans had to take to win the game. They would also deploy in foxholes and were allowed to place two minefields. The German force (played by me) featured a 4 man infantry Platoon HQ, two infantry squads, a two men recon team (which we played as a spotter team), 8cm Mortar team, HMG team and 7,5cm infantry gun. 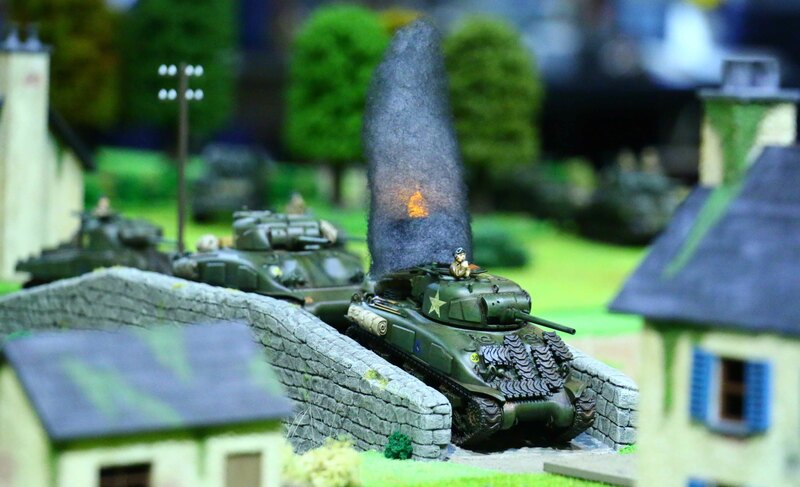 Julians Americans featured an infantry platoon HQ, two Infantry fire teams, one 60cm mortar team and a .30cal team. The American infantry would deploy in the trench, while the other troops were to deploy in the foxholes placed on the edge of the eastern small wood. The Germans would start one infantry squad on each flank (one of them starting at the mouth of the ravine), the infantry gun on the western flank and the rest of the troops in the corner. Now one thing I need to mention before we start the report. With the exception of the first and last rounds I managed to roll low for the number of orders for my Germans every round. So while Julians Americans virtually had more orders than units all the time, the Germans usually could only activate two or three units. In general my dice rolling was quiet poor, while Julians was good. 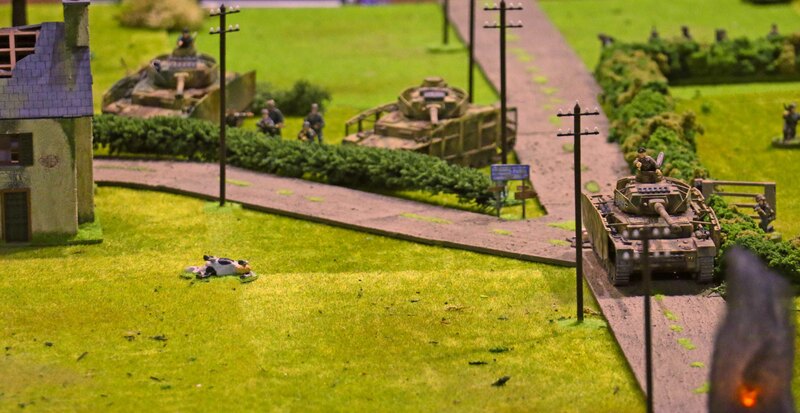 At the beginning of the game the Americans decided to lie in ambush and wait for the Germans. Both German infantry squads started their advance towards the enemy. For the one on the eastern flank this would be their only move until the last round for lack of orders. The one on the western flank came under fire from both the American infantry squads and the mortar team which resulted in both the main squad and the LMG team becoming pinned under fire. The German HMG and recon teams advanced into the orchard and the infantry gun opened fire the American mortar team, missing twice. Ending my first round, I decided to un-pin my pinned troops. Not that it proved much use. On the next American turn they came under fire from the American infantry and mortar teams once more, which pinned them again. So as a result they could do nothing and the next German activation just saw the infantry gun fire and miss again. The HMG team joined in as well and while scoring a few hits, the foxhole kept the American mortar team safe. And again I decided to un-pin my troops again. At least the Germans managed to gain initiative for once. This time the Infantry gun managed to hit once, but again, the foxhole kept the mortar team safe. 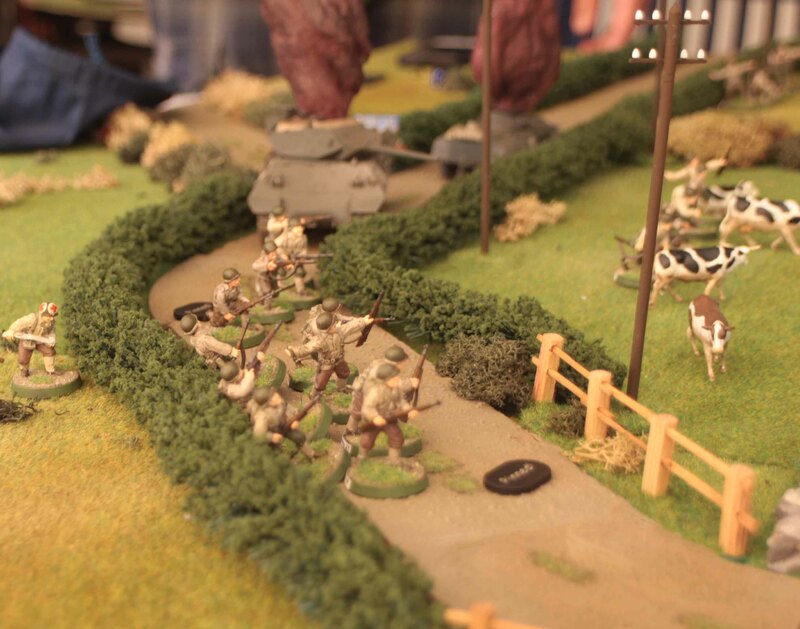 The LMG team on the western flank opened fire and managed to pin one of the American infantry squads. 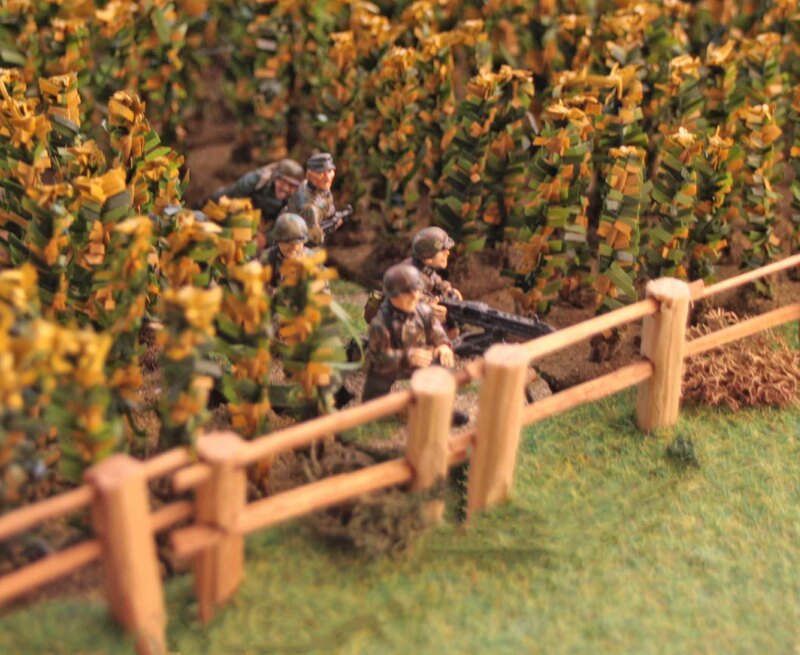 Under their cover the rest of the infantry squad advanced towards the trench. The Americans fired their mortar at the German infantry and the .30cal opened up on the recon team, but both failed to do any harm. To finish things off the American infantry managed un-pinned themselves. The next round the American infantry teams pinned both their German counterparts and the LMG team in the ravine. To end the circle of pinning and un-pinning, the 6cm mortar team fired at the LMG team for effect killing their NCO. This enraged the machine gunner so much, that he rose in spite of the incoming fire and in turn pinned one of the American infantry teams. On their own activation, the infantry gun switched its fire to the American infantry in the trench idling one of them. 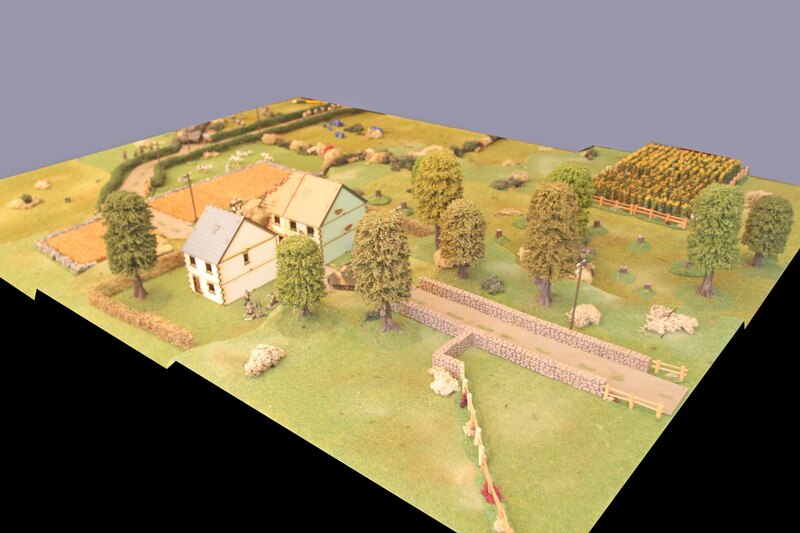 At the same time the German HMG team advanced further through the orchard, but failed to spot any enemy. And once more, the round ended with me un-pinning my infantry team. Now the Landser stormed into the trench and annihilated the Americans pinned by the LMG and Infantry gun fire. The infantry gun tried to shift their fire to the other American fire team, but found them out of range. Now the Americans tried to evict the Germans from their trench. But their infantry lost their nerve and would not assault them. So they brought the mortar to bear on the trench, but that one failed to hit. The next round the American infantry chose not to assault the Germans in the trench, but cleared them out with gunfire. The rest their mortar and .30cal tried to kill both the German LMG team and recon team to lower the Germans moral, but failed to make an impression. Now it became clear that the Germans might not get the chance to take the trench and they too did everything to kill off American teams. And for a chance they did that well. The infantry gun scored a direct hit on the foxhole housing the mortar team, killing them all. The MG-42 on tripod opened up on the .30cal wiping it up and the mortar team fired their only rounds this game, but only managed to kill part of the HQ team. At this point we had reached the end of the 8th round and had to roll to see if gameplay would continue, which it did not. But the game ended with a close call. Counting our counters we found that the Americans were just one point shy of their breaking point, while the Germans were only two points away from doing so themselves. So how did it go with an eye towards trying out the rules some more? 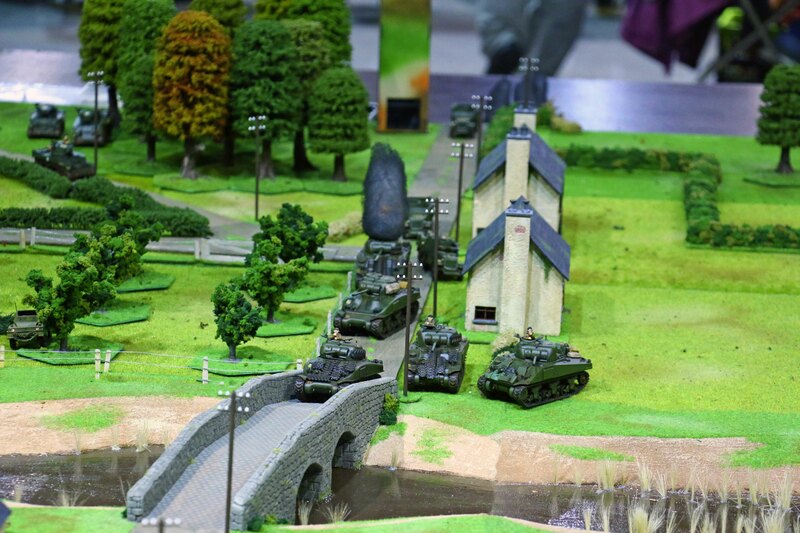 We found that the Battlegroup rules actually played out quiet well with a third-party scenario. While not all the troops in the scenario had exact counterparts in the Battlegroup force rosters it was easy enough to find close options, use their Battlegroup rating and translate quality rating to Battlegroup. The game was still balanced and was great fun (even with my horrible dice rolling). Playing an infantry only game was fun, too. I was afraid, that this would lead to an all too quick end, but this was not the case. The only annoying thing was the constant pinning and resulting un-pinning, but this was mostly due to Julian rolling extremely well and me rolling extremely poor. In a game with average dice rolling this should not be the case. So all in all it was not only fun, but proved well for my general trials of what the rules can do well and what not. I will try to post a report of Sundays game tomorrow, so stay tuned!